According to a report by BIS Research, the surgical robotics market is expected to reach US$12.6 billion by 2025, making now more than ever a prime time for investors to jump into this growing industry. The surgery industry may never be completely automated, but it has come a long way, and the robotic surgical space shows no signs of slowing down. For investors, investing in surgical robotic companies could prove to be a profitable industry as the market is expected to reach US$12.6 billion by 2025, according to a report by BIS Research. While surgeons are still present, robotic surgical procedures help the surgeon to control small instruments attached to a robot and guide minimally invasive surgeries. Robotics can also make smaller incisions than the surgeons and offer videos and lights for on-screen help. Some advantages to surgical robotics include a decrease in post-operative pain, risk of infection and blood loss. Companies developing these surgical robotics are also hoping to reduce overall healthcare costs and the amount of post-operative healing time. The increased occurrence of surgeries used with robotics include rising incidence of colorectal cancer, neurological disorders, interventional cardiology disorders, along with an overall greater population in the world. As the worldwide population continues to grow and age, the prominence of these surgeries will continue to fluctuate. 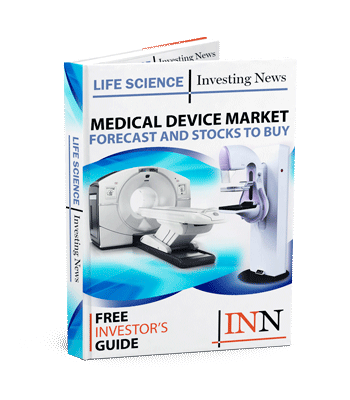 Whether investors have a handle on the medical device industry or not yet, the Investing News Network (INN) is taking a look at investing in surgical robotic companies to give investors an advanced understanding of the industry. The first laparoscopic surgery took place in the late 1980s by Unimate’s PUMA 560 with the help of a surgeon guided a needling into the brain for a biopsy. Previously this surgery faced errors due to hand tremors. Since then, the surgical robotic industry has taken flight. Now one of the biggest names in the industry is Intuitive Surgical (NASDAQ:ISRG) and itss da Vinci Surgery system, which was the first FDA-approved robotic surgery system for laparoscopic surgeries. It was also the first system to have completely comprehensive surgical instruments including camera and scopic instruments. The da Vinci surgical system has changed since it was first approved and now has a 3D HD vision system, clear magnified view inside the body and its own EndoWrist instruments which bends and rotates better than a human wrist. Another company with laparoscopic FDA-approved robotic surgical systems include TransEnterix’s (NYSE:TRXC) Senhance Surgical System which received FDA clearance for expanded indications for its surgical system in May. The expansion now doubles the total addressable annual procedures in the US to cover over three million, such as general surgery and gynecology. Smith & Nephew (NYSE:SNN) has a surgical robotic system for total and partial knee replacement procedures, called the NAVIO Surgical System. The company also has a variety of unicompartmental knee systems, joint system and total knee systems to pair with NAVIO. For spine and brain surgeries, Mazor Robotics (NASDAQ:MZOR) has two systems, the MazorX and Renaissance. Each product works specifically with the patient’s anatomy challenges and has placed over 200,000 implants. Renishaw’s (LON:RSW) neuromate robot is a platform for a range of functional neurosurgical procedures such as electrode implantations for deep brain stimulation, stereoelectroencephalography and some stereotactic applications. Companies like Stryker (NYSE:SYK) and Microbot (NASDAQ:MBOT) have a variety of instruments for surgical systems such as endoscopic or laparoscopic. Developing medical devices is different than drugs for the US Food and Drug Administration (FDA) in that it pertains to the risk of classification due to the vast variation of products developed. The difference is medical devices require a different, but similar system of development and most apply for a 510(k) clearance, proving the device is substantially equivalent (SE). Titan Medical (TSX:TMD) has a unique single-port approach to laparoscopic treatments which could further manipulate the surgical robotic industry. Similar to the multi-port systems currentlyexisting, the single-port could further allow quicker healing times and discharge times from the hospital. The company is currently preparing for regulatory applications which are expected to take place in the second half of 2019. Aside from these top competitors in the surgical robotic market, there’s a solid amount of private companies also in the league. Some private companies with approved products include Medrobotics, Verb Surgical, Hansen Medical and Medtech. Time will show if any of these companies switch to the public market, but it’s always worthwhile for investors to know what else it out there. In short, since the started just over 30 years ago, it has drastically exploded since then. The laparoscopic device market itself is expected to grow at a compound annual growth rate of 5.8 percent to US$14 billion by 2022, according to a report by Allied Market Research. With residual goals of lessening hospital discharge and healing times, amplifying surgeon abilities with smaller incisions and more investing in surgical robotic companies is proving to be a strong investment for the long-term.